I have no further information other than what I can provide you with via the photographs I just snapped. Lauren Weyland shared the news with me on June 25th, but I'm just barely catching up to all the news after being away one month. 3star Tyne makes things I want when I'm in a special mood. Today was a day like that. Deep Sea Fluorescent Flower is a mermaid outfit, complete with skin and fins and wings, but I played with it. She gives you a lot of choices. I added my own electrified hair. To visit her shop, teleport directly from here. 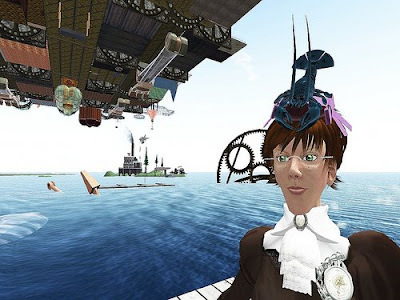 Naiman Broome (rez: 7/20/2007) is a telecommunications engineer from Italy who worked in 3dsMax and Photoshop to create the foamiest, most believable waves I have seen to date in Second Life®. 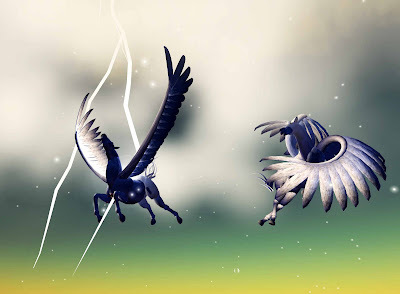 Naiman also works with Sculptpaint and Wings to make sculpties. You can purchase these waves at a little hut on the far end of his idyllic island, Las Arenas Rosadas, which means, the pink sands. Apparently, they have only been on sale a few weeks (teleport directly from here). Naiman is currently working on a new project with Cuba and the Buena Vista Social Club for inspirations. That should open in about a month's time. Many thanks to Naxos Loon who always finds us wonderful things. Oh, I know... the Garden of NPIRL Delights is over! Get over it and move on, Bett!! I just couldn't resist showing you what LittleToe Bartlett did once the doors had been closed and the Gardeners had picked up most of their installations. These are ground textures... sim(s) wide. June 27 Update: Seems polysilox Apogee had also discovered Light Waves' sculpture, way back on May 17th! polysilox had been photo blogging and was checking for the names of content creators for attribution when she made the discovery. Anyways... a few days before the Garden of NPIRL Delights opened to the public, I IM'ed Light Waves asking if he'd like to make us a little something for it. The next day, you can imagine the extreme rush of pleasure and excitement I felt when there was an inventory offering from him waiting for me called simply "Something for the Garden." Did I have to go to a sandbox just in case it was very large, I wondered? I couldn't wait. I rushed to my inventory and rezzed it - quite breathlessly - to the ground... and waited what seemed like an infinite number of seconds for it to rez... Later, Light Waves told me he had wondered if I was going to laugh or cry when I saw it, LOL. I guess I did a little of both... the crying and laughing, I mean. I know that Light Waves is very busy these days, so I was astonished to receive anything at all. But this little naughty gnome! Taking a tinkle on our Garden, no less! Harrumph! Fact is, I'd give my right arm to be able to make anything as well done as this just once... and to think that he made this simply as a joke. What a talent! My brewing mind quickly came up with a plan: I'd extend the joke to everyone who visited the Garden. 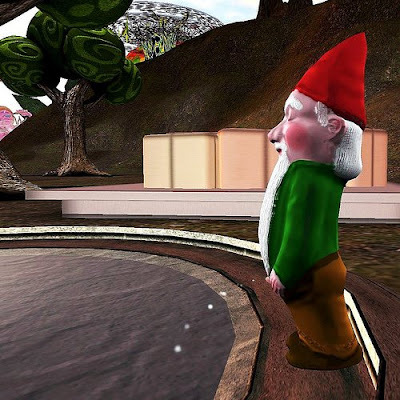 Knowing that I'd be taking a break from Second Life for several weeks, I shared the news of the gnome with the very talented Nectere Niven and entrusted her with it, asking that she move it around, if necessary, to keep people looking for the famous "Light Waves" sculpture. She did better than that. She rezzed it in plain view and even created a little park-like setting around him. ... and there he sat, for the duration of the Garden. 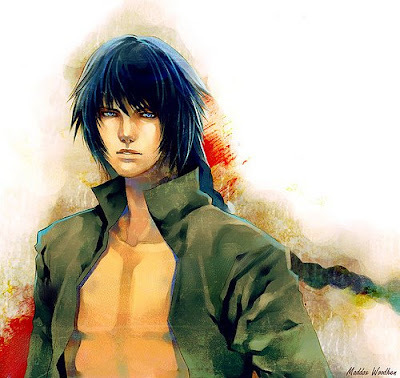 The only person I know who found him was Selavy Oh. Hehe... and so it goes. November, 2008 Update: Sadly, we have since learned that Maddox Woodhen did not create this image. Instead, he copied someone else's work. 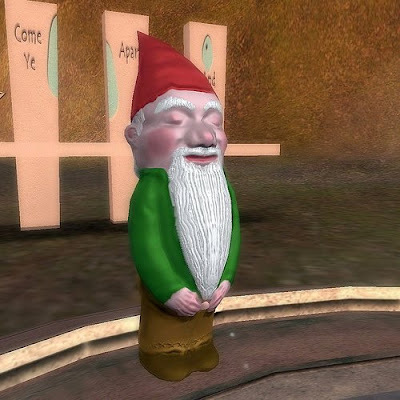 Mr. Woodhen has left Second Life. I will post the link to the original image as soon as I have it. 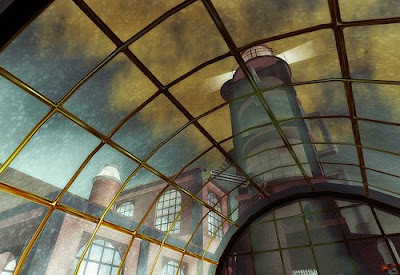 I am convinced that the future of illustration will increasingly involve virtual worlds. 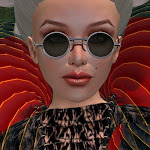 Case in point... Maddox Woodhen created the following portrait of Murasaki Karu - who wanted a Bruce Lee theme - using a photograph taken in Second Life® as a base and then "speed painting" using Photoshop's Burn tool set to "highlights." Maddox (aka Mister Woodhen in Flickr) was inspired by the following video. I wish I knew more about the people behind this. Update - Hint #2: It is a wee bit naughty. Update - Hint #1: It is busy. It's in plain view! Hehe. Canadian artist Aiyas Aya's (aka Christopher Postill) installation, "Upward Race to the Bottom," at the Garden of NPIRL Delights has always had something missing... until today that is. Aiyas, this one's for you! On the spur of the moment a slew of volunteers TP'ed in and we made it happen! 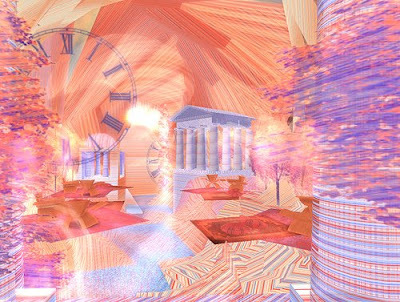 Aiyas describes his installation as follows: "The aim of this piece is to incorporate audience avatars as an integral part of a sculptural form. 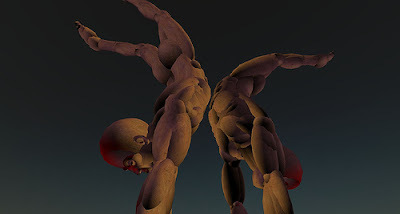 I am creating sculpture using the avatars of participants; the piece requires interaction in order to be completed. This user interaction slowly brings together a rough narrative experience as more and more viewers participate. When properly filled, the piece becomes a wreathing mass of avatar bodies all reaching upward, stuck in a perpetual state of competition. A literal mountain of bodies all supporting eachother but fighting for the summit at the same time. Without participants, the piece is a simple terraformed mountain, but as more audience members sit on the 'pose-balls', the piece transforms into a tableau of never-ending struggle toward the top." Thank you, everyone! More photos can be seen here and here. Some days ago, Quadrapop Tree captured another bodacious attempt to fill the mountain! 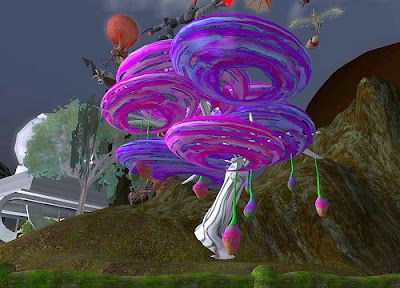 UPDATE - June 24, 2008: The Garden of NPIRL Delights has closed. 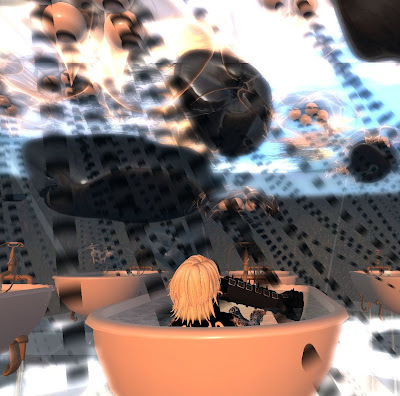 Thanks to everyone who created it and to those who visited it, and special thanks to RightasRain Rimbaud and his team at Rezzable Productions for sponsoring it. 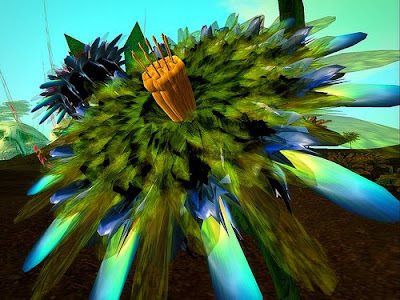 The Garden of NPIRL Delights will end on June 23rd, and several of the very gifted content creators have decided that their work should not disappear. Just look at what they are giving away! Hurry hurry! Whoa! Just discovered this via Moo Money at Massively. 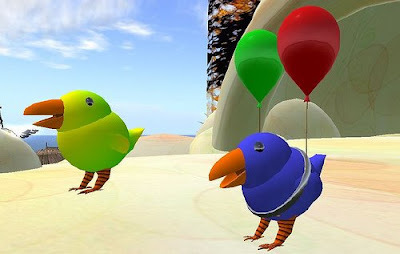 CrazyTalk is an animation tool that transforms any character face into a talking actor, and you can use it now in Second Life®. 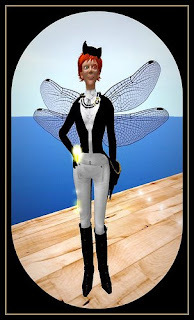 Creating talking Second Life avatars with CrazyTalk from The Martin Brothers on Vimeo. 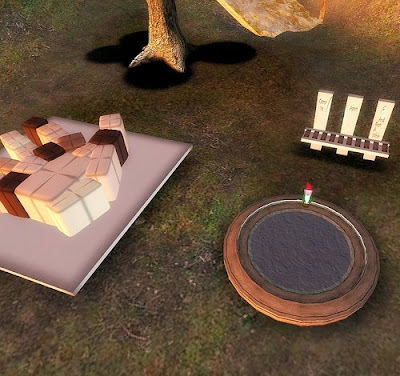 Update: In honor of Michel, Evo Szuyuan has created an in-world tribute in the dorkbot space at the Odyssey, where you can play with his patafone and watch his video (teleport directly from here). 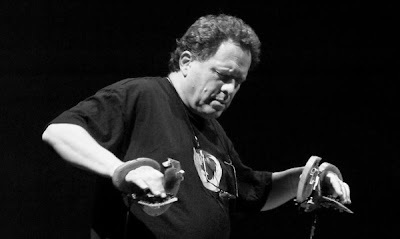 Michel Waisvisz' death leaves a real void in the music world. * Video of Michel performing here. 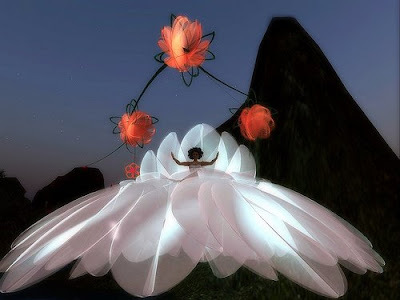 The Garden of NPIRL Delights - generously sponsored by Rezzable Productions - is almost over... *sobs* The last day is June 23. There are so many little and big things that I am going to miss. Collaboration is a powerful thing, and dozens of people made enormous contributions that few people are aware of. 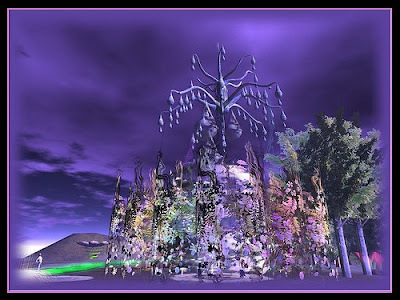 One day before the Garden opened, Ravenelle Zugzwang and Soror Nishi helped me landscape it with their exquisite trees and sculptures. Minutes before the Garden opened to the public, artoo Magneto sent over his phenomenal 3D trees, and elros Tumominen helped me install a few of his flaming sculptures. I hope Glyph Graves will participate in any project I take on. His flowers! His willingness to work with others! The Garden is closing... sigh. Thomas L. Friedman's publisher - Farrar, Straus and Giroux - ran into serious trouble when it came time to illustrate the cover of his book, The World is Flat: A Brief History of the Twenty-First Century. 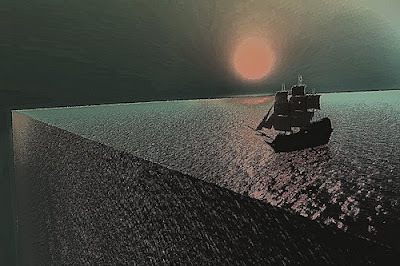 According to Wikipedia, "the original jacket illustration reproducing a painting called "I Told You So" by Ed Miracle, depicting a sailing ship falling off the edge of the world, was changed during the print run due to copyright issues." Shown left is the book's jacket illustration for the 1st edition hardcover: ISBN 0-374-29288-4, (see below for an explanation of "fair use" in regards to the publication of this image). 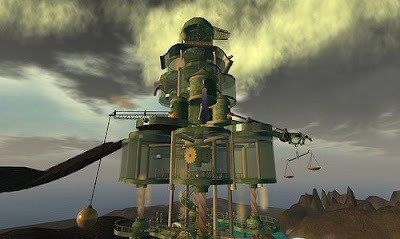 Of course, Second Life® has its own frenzied DMCA and lawsuit environment, including numerous discussions about the rights of content creators who's works are photographed by others and used for commercial purposes, as reviewed in Virtually Blind's thoughtful post on virtual world copyright issues by Benjamin Duranske. 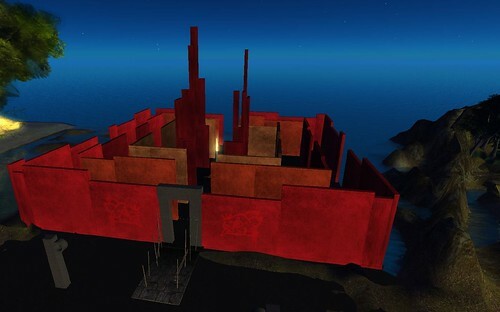 "I had to add the 'edge' effect in, but the coloration is mostly WindLight," says Felony. "If I could have achieved the effect in-world, I would have tried ... :)"
I just bet that there's a builder among you who could do an outstanding job of creating a camera-ready environment for Felony. 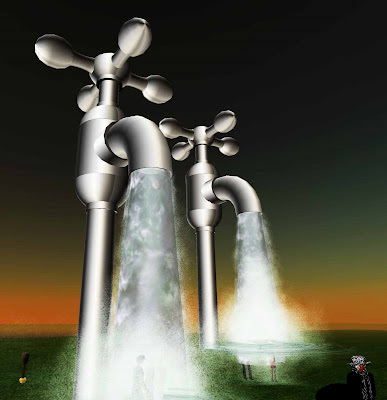 In fact, I will make arrangements for the land + prims needed if I have any takers. It's worth noting that Felony doesn't Photoshop. She prefers Paint Shop Pro and does some 'painting'. She also uses a tablet on occasion. She gets an A+ for concept in my book. * The Not Possible IRL blog is a not-for-profit online publication. * This image is used for informational and educational purposes. * This image is of the first edition of the book and cannot be replaced with a freely copyrighted image of comparable educational value. 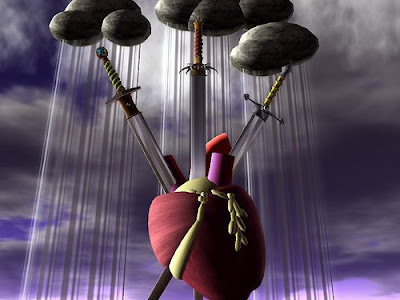 * This image is the only way to illustrate the topic of this blogpost. * This image is a low resolution image, and has no commercial reproduction value. * This image is only a small portion of the commercial product. * The use of this image will not affect the value of the original work. * The use of this image will not limit the copyright holder's rights or ability to distribute the original. Copies of this image could not be used to make illegal copies of the book. Madcow Cosmos is industrious, yes. He uses prims with wild abandon, yes. Since he upgraded his computer a few weeks ago, this Canadian chef-by-day - creator-by-night's work has soared. His texture work! His elegant touches using glow! Madcow likes to work against a theme. This time: the entire Tarot deck... major arcana, minor arcana, the works. While he is loosely basing himself on the Rider-Waite deck, he has realized his own metaphorical interpretations and, while he is just about halfway through (there are 78 cards), multi-sim gallery owner Alexander Vargas couldn't wait. He has generously provided Madcow with two sims to exhibit the 40-some completed pieces, and to complement them, he has added a notecard to each one explaining the significance of that card. 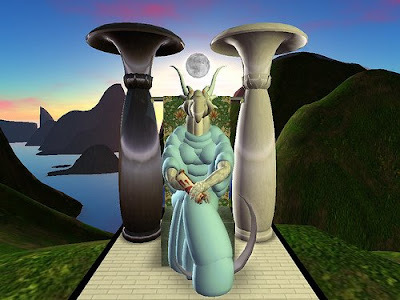 Even more exciting... Alexander is awaiting delivery of yet another sim, by which time Madcow will have more cards completed... and... when the full deck is ready, Madcow is looking for ways to do scripted Tarot spreads and readings. 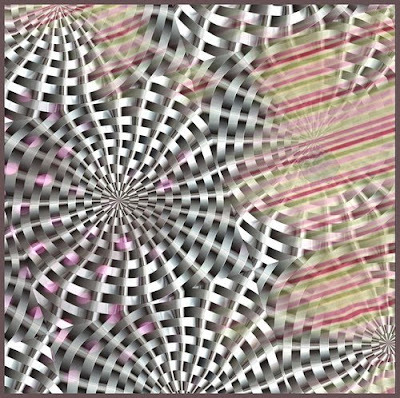 Molly Montale - who believes that this is "the most impressive prim work in Second Life®" - has just finished photographing a number of these pieces, and I liked her work so much that I prefer her captures to my own. Thank you, Molly! 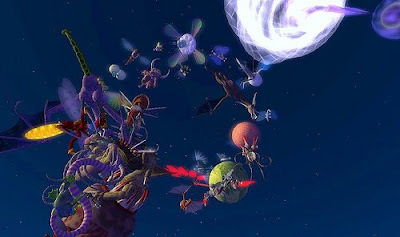 * It's a Madcow (Cosmos) Madhouse! * Catastrophe! Spacejunk falls from the sky! It is seldom that one encounters an individual who is so consistently resourceful, knowledgeable and proper, but add to this her Napoleonic abilities with all things explosive and this Victorian-era Grande Dame is one-of-a-kind. To think that I might have gone to my grave without ever knowing such a person had I not had a Second Life®... well, it's unthinkable. She's also a hard one to pin down, as she will not exhaust her freshness. 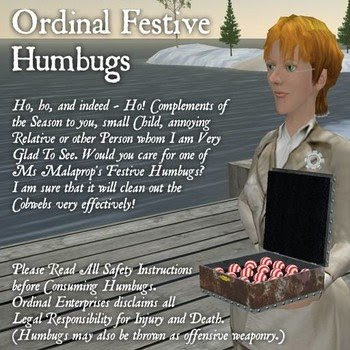 The thing is, Ordinal Malaprop (rez: 9/9/2005) is filled with enterprise, and she is just as apt to take on the entire world by mounting a campaign for or against a cause, as she is to be found proffering delectable candies that, upon the first nibble, go Kaboom! and bring you to your knees in a smoldering heap. Really. 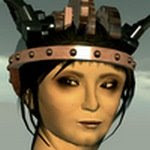 Ordinal is widely known and admired for successfully taking on the ad farmers (or what she calls "griefing builders"), those hideous ads and things that are "designed to make neighbours give up and move elsewhere, or give up and buy the plot to get rid of the horrible spinning thing." It all began quite innocently enough with a blogpost and the creation of a Flickr group, followed by a notice that she posted on the Forums, but soon escalated into a heated conflict regarding a "DMCA Takedown Notice" issued by Flickr in response to a complaint filed by a certain Cytherea Eagle for having reproduced her "logo," in said incriminating images. 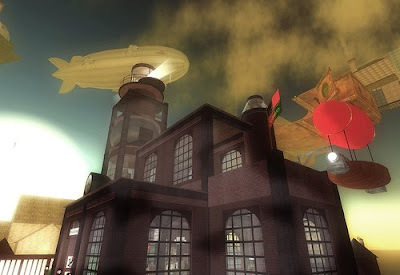 What happened next will surely go down as one of Linden Lab's most appreciated moves of 2008. 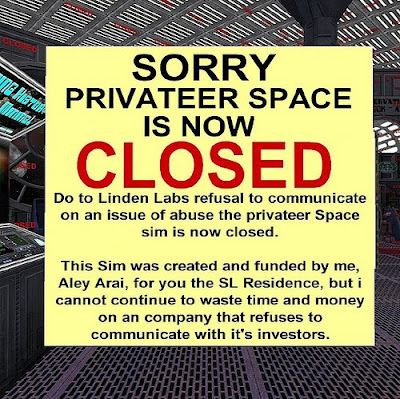 To everyone's utter astonishment, Linden Lab listened to the community and took action: they banned ad farming! It was Ordinal who enlightened us with her much celebrated Cosmology of the Grid: "I have noticed that there does still seem to be some Confusion amongst Residents as to precisely the relationships between Linden Laboratorye, the Grid itself, other Parts and also the Broader Aethernet, which does seem to be causing Misapprehensions as to the origins and behaviour of certain Aspects and Components. 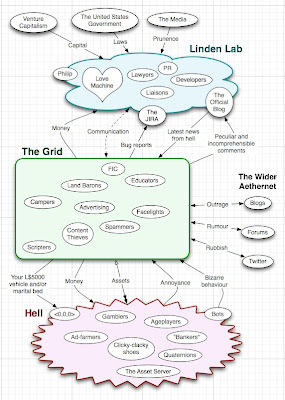 "I am always of a bent to properly Explain the Technical Nature of how these things operate, and for that purpose I have prepared a small diagram of the Cosmology of the Grid and Second Life, which I hope will prove useful. No doubt other Grid-Cosmological Types will have disagreements with the Details, but I believe that the basic structure is sound." Ordinal may be wasp-waisted and wear the most extraordinary hats, but I think we should make her a five-star General, or whatever the equivalent is in the UK (more on her titles in a moment). Just before the Garden of NPIRL Delights began, I spent some delightful hours with her, and while that conversation is somewhat dated, I think it very much worth your while that I share some highlights from it. Might you tell us a little about your whereabouts and your background? Ordinal Malaprop: I live in London at this moment in time, obviously the best city one might choose. I have a background in scripting and programming and all that sort of thing. I am trained in Artificial Intelligence matters, not that I actually do much with it, but, you know, one rarely does do anything with one's purported areas of expertise. 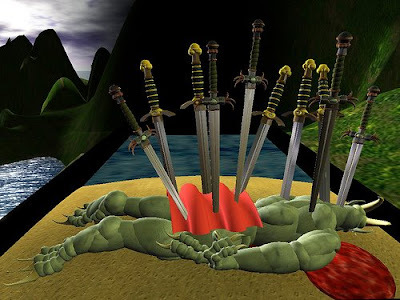 Is that what bridged your entry to Second Life? Ordinal Malaprop: Well - it has had some influence. 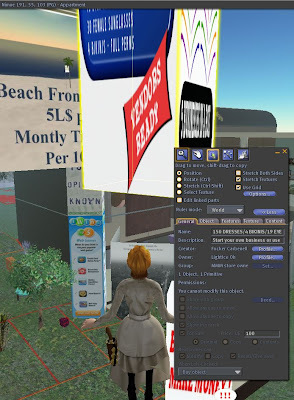 SL scripting, to be effective, requires the use of a lot of independent agents, and that is something which AI education does teach: various entirely independent little monsters, all talking to each other. 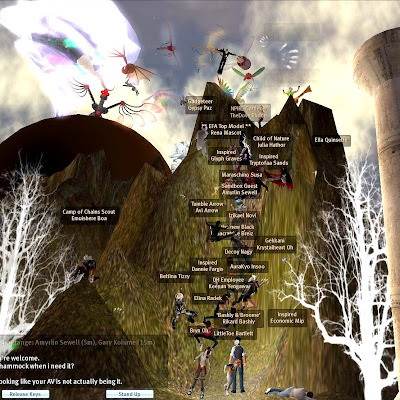 Your early days in Second Life... what were they like, whom did you meet? Ordinal Malaprop: For the first month or so I was utterly baffled. There were two stages bringing me further inwards... Firstly, a friend handing me an awfully large number of free scripts, which I could play with and learn from (and on this basis, I hand out many myself), and secondly, meeting up with Victorian and Steampunk groups. The Withnail Academy was a great help, to begin with. Gives one a sense that one is not alone. I think everyone would like to feel that. What is the Withnail Academy? Ordinal Malaprop: ...I have nothing to do with the "correctional" ones. Schoolgirls. Naughty ones. You know. 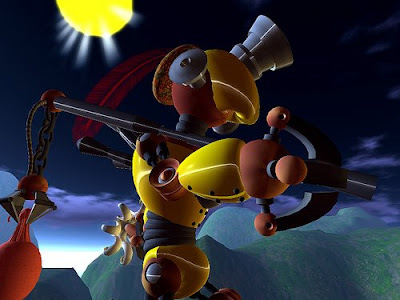 How long has Babbage been around and were you instrumental in making this community come togther? One of the founders, perhaps? Ordinal Malaprop: Ah, well. First we had Caledon, and the steampunk group had a parcel here. I bought this parcel at the same time. We had the Lodge, where we would gather to tell tall tales and suchlike. It is now pretty much a place with a few trees on it. 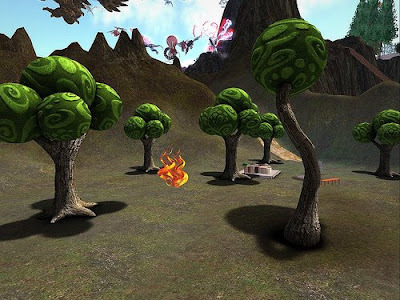 Then, the main founder left Second Life. The Mayor of Babbage, Shaunathan Sprocket, branched out to start the New Babbage sims. Really, Caledon is now more of a place for Victorianesque socialising and activity, rather than the sort of hard steampunkish design that Babbage hosts. Do you have a specific role here? Ordinal Malaprop: Well, I have titles. I can't remember them all. Oh, er, I am a Knight of Caledon, or rather a Lady, and... actually, I have shields outside my front door. Some Caledonians do pay a lot of attention to that, but I am one of these dubious Suffragette, Socialist types. I ask about your community because your character is so closely aligned with it... it seems important. Ordinal Malaprop: I was here before any such community, and doubtless I shall be after it :). I used to live on the mainland and conduct myself pretty much in the same way. 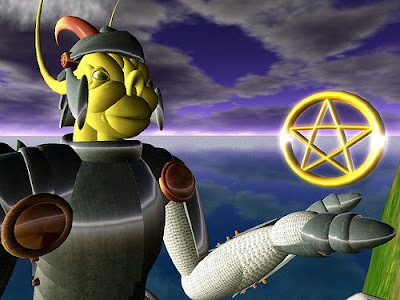 With your knowledge of scripting... what are your wishes... things that you wish we knew... that would make things better, keeping in mind that most everyone came in-world within the last year? Ordinal Malaprop: Turn off your clicky-clacky shoes! That is mostly because I hate them. They do poll assorted places though and are inefficient - ask Codebastard - who will say the same. Er, temp-rezzers are really bad; don't use them. If you use them, don't complain that your sim appears to be in a treacle well. What are the commands to turn off shoes? It is in preferences, yes? Ordinal Malaprop: Unfortunately there are no shoe-specific commands. They will still grab controls. Hmmm. Will have to get to the bottom of this. It seems important. Ordinal Malaprop: Oh - and the other thing I am always telling people: nobody can follow you, or cage you, or enslave you, no matter what they say. Teleport out, then somewhere else. Actually, just one will usually do. Ah... I didn't know that. I thought one TP would suffice. This has to do with followers? 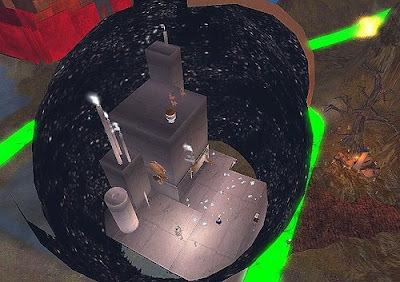 Shall we talk about explosives? You are the one person most closely, um, associated with them. 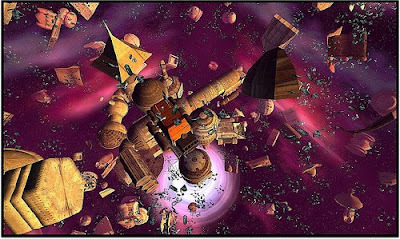 Ordinal Malaprop: My reputation has always been "builds things with rivets, which explode." How'd that get started? That first set of scripts? Ordinal Malaprop: Physics scripting is one of those things which is immediately obvious as something which affects the outside world. Not just a technical point, but it has an immediate effect. So, it is the starting point for a lot of people. Some might go into "griefing," but that is rather dull to be honest, so, things which explode! 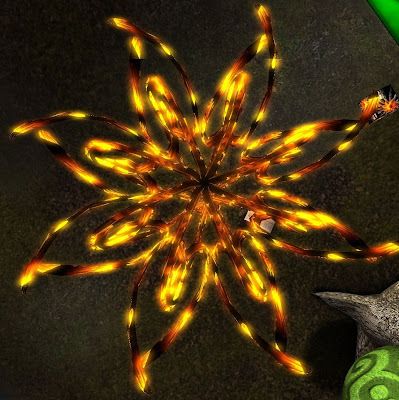 It is also a terrific way to learn how to make particle effects. Ordinal Malaprop: Oh, griefing with scripts is the sort of thing people without any imagination do. I have seen some of the scripts these people use - they are awful. I do know a fair number of... "experimenters" :) I enjoy their company. I do not do that much with that sort of thing these days, but I like to know the latest. Ordinal Malaprop: I have three main branches there: Firstly, things for Rezzable, which are either too specific or not ready to be announced :) Secondly, general ideas - I am, for instance, working on a "point gravity" simulation, which will have people falling towards masses in a sim rather than the ground, and turning themselves to face that point. A few issues are bothering me there. 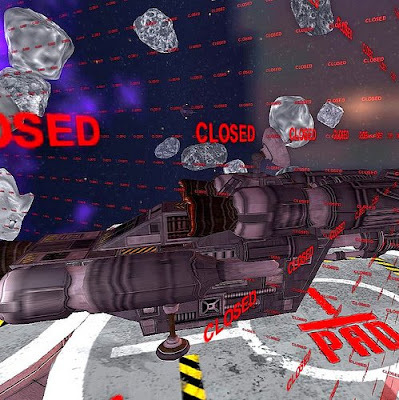 It could be useful in the Privateer Space sim though. You know, asteroids which you can stand on, but jump from one to the other. The third is very personal ones which are "in character" as it were, though I hate that phrase. Because it sounds like RP (role-playing)? Ordinal Malaprop: "Am I some sort of music-hall player?" as I have said. There is no playing of roles here! No pretence. Caledon operates on a rather different basis but, for instance, in that category I have been working on a Battlefield Teapot... something a soldier can wear, which will deliver a proper cup of tea at any instance. I have a shop on that basis; the products that I sell are all in that genre. Ordinal Malaprop: Well, tea built the Empire. Do you prefer to work alone on these projects or do you find yourself collaborating? Ordinal Malaprop: For everything apart from the professional i.e. Rezzable at this point... they are all individual. 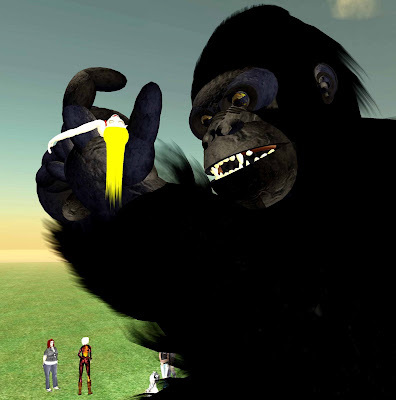 Second Life is such a poor environment for collaboration. Let's talk about hats. Have you always worn them? Ordinal Malaprop: No. But as soon as I was aware of them I did. 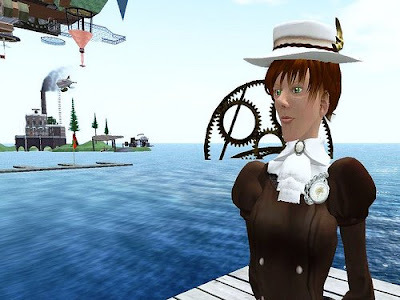 Hats are one of my favourite parts of Second Life. Ordinal's signature lobster hat. She always wears glasses, and occasionally a monocle. "Very 'Girl Genius'"
How many do you currently wear? And do you make your own? Ordinal Malaprop: Well - I have, oh, a dozen or so favourites. No, clothing is one of those things I just find myself unable to make. 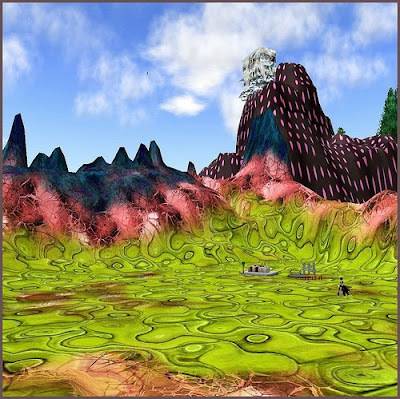 I am very fond of the products of Chapeau Tres Mignon (teleport directly from here). The lobster hats, which I have been known to wear, are from there. I also like boots, but I just cannot find proper ones. I normally wear glasses, too. Can't see a thing otherwise. What is your favorite product... one that represents what you do best? Ordinal Malaprop: I am most proud of my Swordstick, I think. That has a combination of all sorts of disciplines. I consider myself a a generalist, thus if something involves texturing, animation, scripting and building, I approve. Your infomercials... am I correct in understanding that you were the first to do them? Ordinal Malaprop: Well... I am not sure. I am the first that _I_ know of. Certainly the first to be widely publicized. Which is, of course, the usual reason, but yours are works of art. Have you made any recently? Ordinal Malaprop: Oh, functional art. Not as such, but whatever I produce from now on will have an appropriate video. The last thing I think was the Brian Eno paintings widget. Are you PC or Mac based? Ordinal Malaprop: The Macintosh, certainly. I could not hide that based on Twitter. Ah, yes... Twitter. You developed that lovely in-word device: the Twitterbox. Do you find Twitter very useful these days? Ordinal Malaprop: Oh, yes, without it I would not know what on earth was going on. Not that I necessarily do anyway, but as long as a few people use it, and post relatively significant things... I am not much interested in the whole "I'm getting on the bus now" rubbish. Incidentally, while conducting my research for this piece, I was rather surprised to learn that it was a German Franciscan Monk by the name of Berthold Schwarts who developed gunpowder and its use in guns. Ordinal Enterprises, can be found by teleporting directly from here. 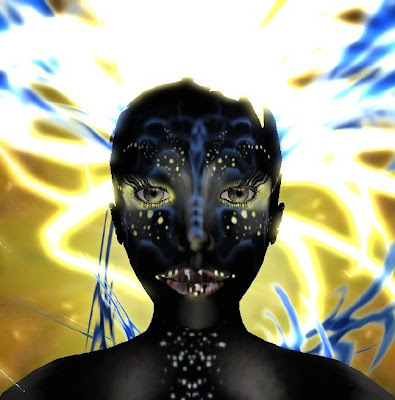 Truthseeker Young's "The Singularapture is Near"